What would the present day Bob Dylan make of his teenage poetry? Dylan was just 16 — and still going by his given name Bob Zimmerman — when he wrote "Little Buddy" in the summer of 1957 for the newspaper at Herzl Camp in Webster, Wis.
Now the poem is being offered for sale at a Christie's auction, where it is expected to sell for $10,000 to $15,000 on June 23. Fellow camper and editor of the Herzl Herald, Lisa Heilicher, has decided to sell the poem to help support the camp's $8 million capital campaign. "I kept it with all of my stuff that I collected from camp," Heilicher said in a telephone interview from her home in Minneapolis. "When I realized how famous he had become, I put it in a piece of plastic and stuck it in an encyclopedia" — under the letter 'Z' for Zimmerman. Written on both sides of a single page, the poem tells the poignant story of Little Buddy, who is killed at the hands of a drunkard, and the boy who mourns him. "He was such a lovely doggy/ And to me he was such fun/ But today as we played by the way/ A drunken man got mad at him/ Because he barked in joy/ He beat him and he's dying here today," the poem reads. "It's a very early example of his brilliance," Simeon Lipman, Christie's pop culture specialist, said. "It comes from the mind of a teenager (with) some very interesting thoughts kind of percolating in his brain." Besides the summer they spent at the 120-acre camp, Heilicher and Dylan both attended the University of Minnesota as freshmen. But after that, they lost touch. So when Heilicher decided to sell the poem, Herzl Camp asked Dylan's nieces and nephews who work for the camp to tell him about her decision. Dylan, who turns 68 on Sunday, told camp officials, "Do what you want with it," said Holly Guncheon, Herzl's development director. Several other pieces of Dylan writing are being offered at the pop culture sale, including his working lyrics for "With God on Our Side," an early song estimated to bring $20,000 to 25,000. Dylan's 1958 yearbook from Hibbing (Minn.) high school is expected to bring $6,000 to $8,000, and contains a typical high school inscription to a classmate. It says in part: "Dear Brenda, Well, I didn't see you too much this year but you know what went on in study hall was just kidding ..."
Lipman said there is very little Bob Dylan ephemera available from the years before the singer-song writer came to New York in the 1960s. In 2005, a collection of poems written by Dylan as a college student sold for $78,000 at Christie's. Of that summer in 1957, Heilicher recalled Dylan "banging on the piano instead of going to the (camp) sessions." 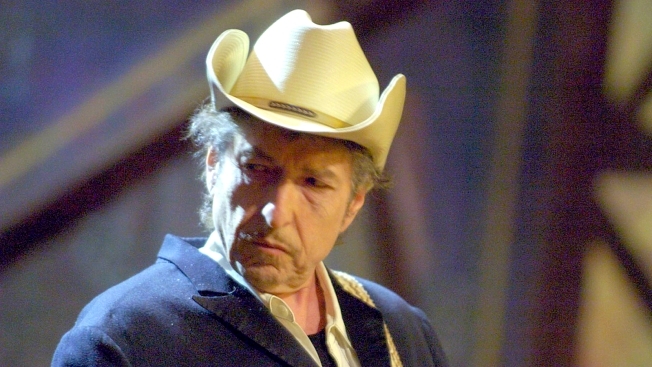 He pays tribute to those days on his 2008 CD, "Tell Tale Signs," which features a photograph of the 16-year-old Dylan holding a guitar surrounded by other campers. "He was different," she said. "He was way before his time."